Artist Spotlight is curated by Bullet Music to showcase local talent in Atlanta. 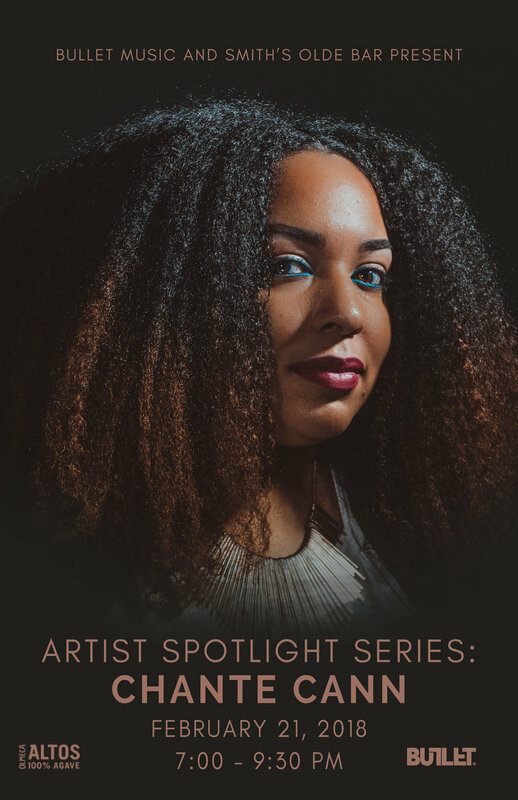 Our spotlight is shining on Chantae Cann. We have teamed up with Smith's Olde Bar to provide an exclusive "RSVP Only" event, much like NPR's "Tiny Desk Series," where our Spotlight artists play an acoustic set live streamed to the rest of the world. Join us Wednesday, February 21 at Smith's Olde Bar from 7:00-9:30 p.m. in the Atlanta Room. Be on the lookout for the full video interview with Chantae Cann as it will be publishing on www.bulletmusic.net the same day. Sneak peek coming soon! 1) RSVP to the Facebook event 2) Donate any amount of your choosing below! We are proudly supported by Alto's Tequila! Chantae Cann’s second studio album (Sol Empowered) released on October 13, 2017, earned the #8 spot on the Jazz Billboard Charts. Sol Empowered further solidifies Chantae’s signature sound while referencing the comforting sounds from her first album, Journey To Golden. Lyrically, this is a love letter from Chantae to her listeners with an in-depth look at her evolution as an artist, and most importantly who she has come to be as a person. Sol Empowered is intentional and deliberate, yet free-spirited. Win Tickets to Dizzy Wright on 2/21 at Center Stage in Atlanta!